You are here: Home / Natural Fine Planetary Talismans / Priceless and Eye clean Ceylon Yellow Sapphire set in dainty two tone gorgeous finger ring. Powerful Jupiter energies! Priceless and Eye clean Ceylon Yellow Sapphire set in dainty two tone gorgeous finger ring. Powerful Jupiter energies! 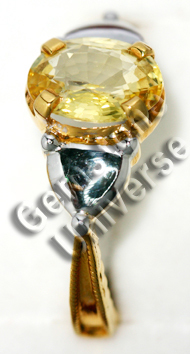 Natural Unheated Ceylon Yellow Sapphire of 2.42 cts set in two tone 22KDM Gold Ring! Priceless and Eye clean Ceylon Yellow Sapphire set in dainty two tonne gorgeous finger ring. Powerful Jupiter energies!